The great storm of 1905, aka the Mataafa Storm, proved a point the Lake Carrier’s Association had been making for years: since the canal was only three hundred feet wide, the South Pier Light wasn’t sufficient for mariners to guide their craft at night or in foggy weather, even with the help of the Rear Range Light. Too far south and a ship would run into the pier; too far north and it would beach on the rocky shore. The LCA made repeated pleas to the Lighthouse Board to build a light but were turned down time after time. Frustration led the organization to place a temporary light at the end of the North Pier in 1908. 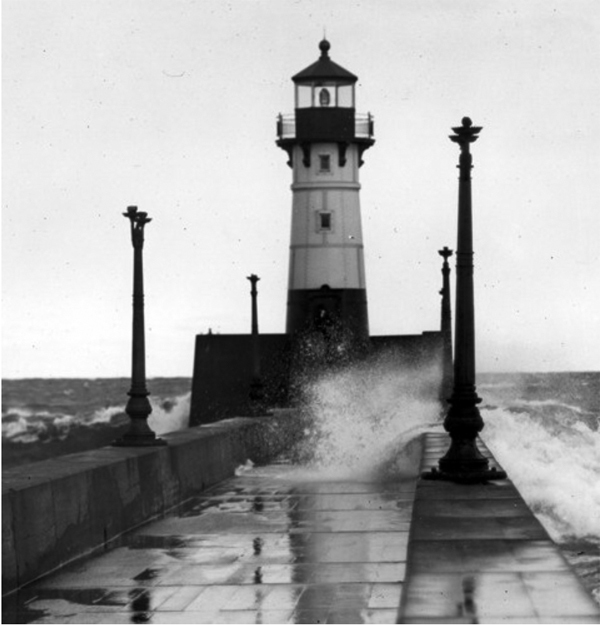 A year later, the Lighthouse Board called the Duluth Harbor “one of the worst and most dangerous on the whole chain of [Great] Lakes.” The report—along with the evidence from 1905’s Mataafa Storm —bolstered the LCA’s argument and Congress appropriated $4,000 to build a lighthouse. 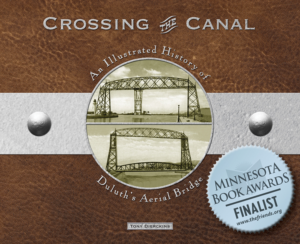 Building began in late 1909 and finished after the opening of the 1910 shipping season. An iron tower enclosed by steel plates, the North Pier Light stands thirty-seven feet tall, measures ten-and-a-half feet in diameter at its base, and tapers to a diameter of eight feet at the top. An octagonal cast-iron lantern holds a Fifth Order Fresnel lens made in Paris in 1881, originally illuminated by a 210-candlepower incandescent electric lamp. In clear conditions, the light can be seen eleven miles away. Keepers first displayed it the night of April 7, 1910. Its white light was later replaced with a more navigationally appropriate red light (so that, along with the South Breakwater Light’s green lamp, skippers can more easily identify the canal’s entrance).